Motorcycles are one of the most dangerous types of vehicles. Motorcyclists on the roads are the most vulnerable component of the transport stream. They get into accidents more often than motorists. Injuries to motorcyclists are usually much more severe. Motorcyclists rarely get off with only bruises and scratches. 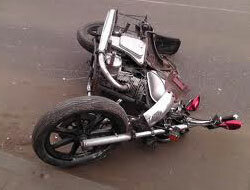 Injuries sustained by motorcyclists are mostly moderate to severe degree. As a result of the Motorcycle Accidents, motorcyclists can sustain broken upper and lower extremities, severe damage to the head, neck, back, chest, etc., as well as damage to internal organs. If a Motorcycle Accident has happened to you, your relatives, or your friends, urgently call SLOMYANSKI LAW at 416-519-1006, or send a fax to 647-340-2899, or complete the form on our website in order to get a free consultation. You pay only after you receive compensation.